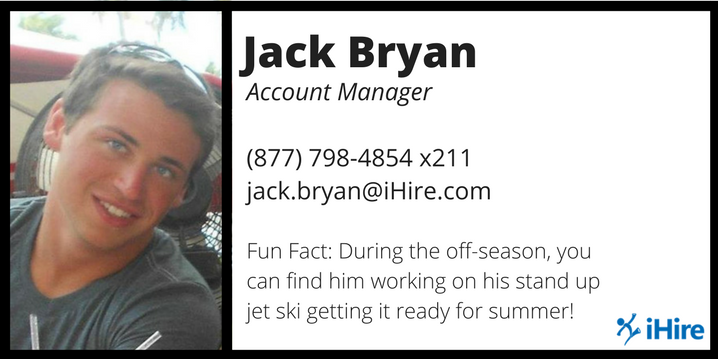 Meet your Account Manager, Jack Bryan! Jack joined iHire in July 2017 and leverages his background in healthcare to help hiring managers in this competitive market find the right talent for their teams. What is your favorite thing about your job at iHire? JB: Our results-only work environment (ROWE) that gives me the ability to work at a pace and style that works for me! JB: The big difference with iHire, compared to other leading job boards, is our ability to find qualified candidates for our clients! Our 56 industry-specific websites make us a great resource for companies needing to find candidates that have the experience they’re looking for. Also, we have a great Customer Success team that will do everything they can to make sure your posting is effective. What are you most proud of accomplishing so far at iHire? JB: What makes me feel successful within this position are the strong relationships I’ve quickly built with many clients that continue to come back to me. 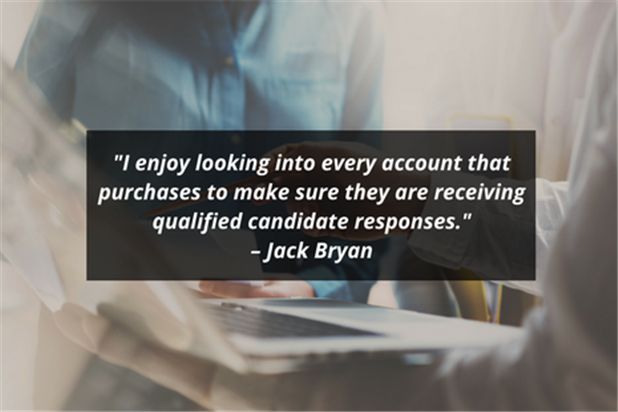 I do everything I can to make certain that I am reliable for my clients, and I enjoy looking into every account that purchases job postings to make sure they are receiving qualified candidate responses. JB: My previous job was to consult new dental patients coming through our office to help put their anxiety at ease and find them affordable ways to get them the care they need. The practice was focused on helping our patients: if you’re keeping the patients happy with the care you provide, then everything else will fall into place. What recruiting/hiring trends excite you? JB: The recruiting/hiring field is a whole new ball game to me. iHire is a technology-based company, which of course is consistently changing. Watching our development team take an idea and make it a success is what excites me the most! It always has me thinking of new ways our company can continue to grow, and sharing those ideas is always welcomed and answered quickly by our management team. JB: I spend most of my free time outdoors. In the spring and summer, you can find me out on the lake fishing or relaxing with some friends. I’ll usually spend my time out hunting in the fall, and in the winter I’ll be out ice fishing. I have a two-year-old daughter (which my life tends to revolve around) and I love every minute I get to spend with her. She’s not quite old enough to hunt and fish with me yet, but she never turns down a summer pontoon ride! JB: Growing up, I always wanted to be a Conservation Officer. It wasn’t until after high school where I landed a position within a hospital as a Dialysis Tech where I found myself shifting towards a healthcare-related degree. I ended up getting my degree in healthcare administration and have continued to grow my knowledge and experience within the healthcare industry ever since. JB: Anything that’s full of action usually holds my attention. Avatar is one example that definitely comes to mind. It was one of the first 3D movies I had seen in theatres, and to this day I’ve not seen anything come close to how cool of an experience that was! What’s the best piece of advice you would give someone who is not having any luck finding the right candidate for their job? JB: It’s all about patience and perspective! Instead of putting the main focus on what you need as an employer in your job ad, focus on the most exciting aspects of working for your company to entice the right candidates to apply. What makes your company a great place to work and your culture unique? What do people in your organization get excited about doing? Remember that your ideal candidate probably already has a job, and many companies are competing against you for a small talent pool, so put your best foot forward. Any other fun facts you’d like to share? JB: I have a stand-up jet ski that I enjoy repairing in the off-season (considering I usually break something that makes it inoperable by the end of summer).